The Roundhouse has a quirky, modern interior that contrasts with our humble countryside setting. Expect high-end luxury with our hand chosen fixtures and fittings – think industrial chic, sumptuous fabrics, cosy wood burner and underfloor heating allowing this beautiful glamping option to be enjoyed all year round. The luxury fittings extend to the stylish, fully incorporated luxury en suite bathroom. 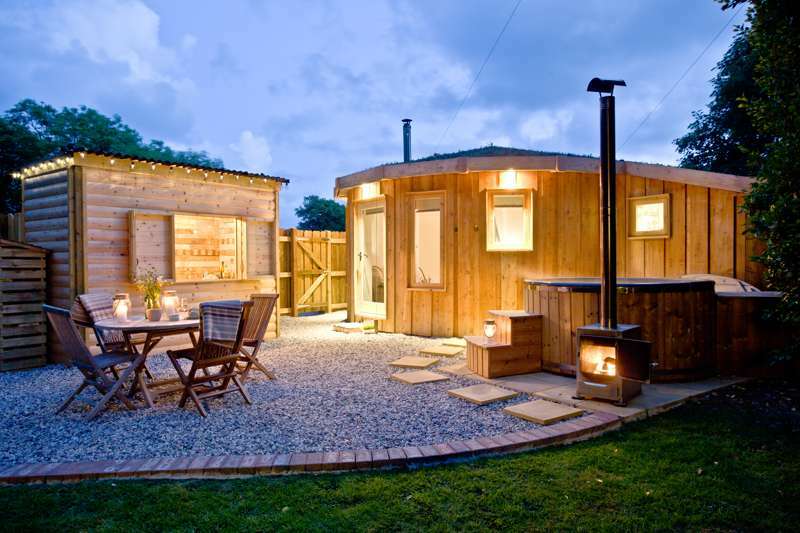 In the Roundhouse’s own private garden tucked away from the main site you’ll find your own wood-fired hot tub (round of course! ), covered alfresco supper kitchen and a fire bowl for cosying up in the evenings. The larch wood Roundhouse is covered in an insualting ‘eco’ grass roof with central sky port hole for star gazing. Guests staying in the Roundhouse are still able to access the community spirit of East Thorne and its facilities, such our outdoor pizza oven and communal camp fire. Or kick can back in their own private area tucked away from the main site in a romantic haven set for any special occasion. This VIP option can also be used in conjunction with the yurt glamping we have on site for larger groups looking for an outdoor get together.